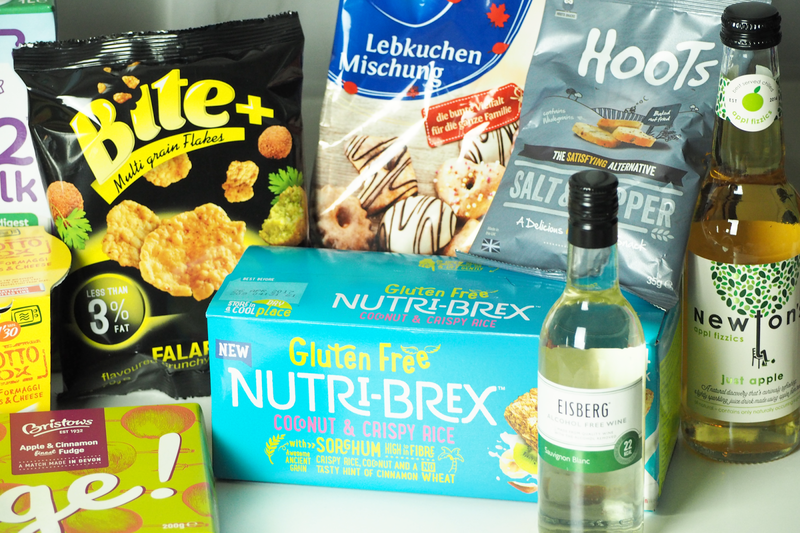 I enjoy getting to try some different foods and drinks that are packed into the Degustabox* delivery. This month there was a good month of snack, meal and drink items. If you'd like to see what I got in other month's boxes you can check them out here. As much as crisps are a nice snack to have they aren't the healthiest item either. These Hoots multigrain snacks are a good alternative as they are baked not fried, and a great source of fibre. A bonus is that they are suitable for vegetarians and vegans too. I received the salt and vinegar and salt and pepper flavours and they were really nice and I would definitely buy them myself. A festive inclusion just in time for Christmas were the Bahlsen Lebkuchen Mischung with a range of gingerbread pieces covered in chocolate and glazing. I'm not the biggest fan of spiced snacks but for those who do enjoy them, these would be ideal to open up to share with family and friends. Another one from this brand was the Bahlsen Akora heart-shaped lebkuchen which are filled with spiced jam. If you wanted something a little different, then these BITE+ Multi Grain Flakes are make from seasoned rice and whole wheat cereal flakes. I got the Falafel flavour which was interesting, but they also come in sour cream & onion, sea salt & pepper and sweet chilli. 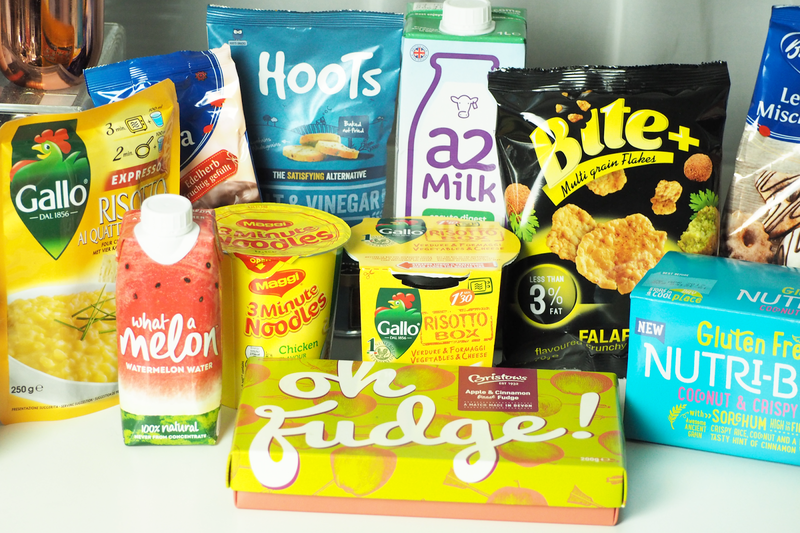 The last items for the snacks is the Oh Fudge gift box. I received the Apple & Cinnamon box which I wasn't keen on as I absolutely hate cinnamon and would have much preferred the Sea Salt & Caramel Fudge flavour, but each piece is individually wrapped which I thought was handy. Starting with the Gluten Free Nutri-Brex cereal, this would be ideal for those who don't or can't have gluten in their diet. Sometimes gluten free products tend to have a lack of flavour, but these have a 'tasty hint' of coconut and cinnamon, while still being high in fibre to give you a good start to the day. Something that could be eaten as part of a main meal or as a snack, this Gallo Expressso 4 Cheese Risotto Pouch would come in very handy. It's a creamy Italian classic that is ready in just 2 minutes in the pan, or 3 minutes in a microwave so would be ideal if you needed something making quickly. Another one from Gallo is the Riso Gallo Risotto Box 3 Cheese & Vegetables. This is an even easier and more practical option that is ready in a minute and a half in the microwave. I could see this being very useful for someone to take into work as it would require minimal time and effort to make. The last meal item this month is the Maggi 3 Minute Noodles. Hence the name they only take 3 minutes to cook and make for another easy snack or lunch. I've always enjoyed apple flavoured drinks so I was excited to see the Newton's Appl Fizzics included. It is a refreshing blend of apple juice and sparkling water which is completely natural with no added sugar or sweeteners. The Eisberg Sauvignon Blanc Alcohol Free Wine was a nice single serve bottle that would be ideal if you fancied some wine but were staying off alcohol. Seen as when you cook with wine it burns off the alcohol anyway, this wine was the perfect size that I ended up putting it in a risotto. Not going to lie, I found the What A Melon Watermelon Water little box quite cute. It is a cool and refreshing drink that hydrates you while giving you a key anti-oxidant and amino acid. The last item from this month's box is the a2 long life semi-skimmed cows milk. This is different to other milk as it's easy to digest as is is naturally free from the A1 protein which can trigger symptoms normally found with lactose. This could be used for having a glass of or using on cereal. If you fancy signing up to Degustabox then I have a discount code that will save you £7.00 off your order. Just enter 0GAWD at the checkout.